Heat is a byproduct of many processes today, even high precision and high-speed operation technologies. Servers, variable frequency drives, spindle motors and other countless components need perpetual or regular cooling to perform optimally. HVAC systems in a typical commercial facility can consume up to 30% of the total energy. Industrial facilities can use more than this, especially if they feature substantial process loads. In short, cooling systems use a monumental percentage of the total HVAC energy. Instead of having a risky refrigerated system all over the facility, installing an energy efficient chilled water system for your next big project is an excellent idea. You can save up to 40% of energy in the process. We will show you why and how. These systems feature many other supportive components including controls, pumps, refrigerant/ water treatment, filtration devices and air eliminators/ air separators. We could divide applications of chilled water systems as commercial and industrial. Campuses, large commercial buildings and similarly large sized projects require chilled water systems for their cooling equipment. Industries are faced with stringent EPA control requirement and worsening utility cost situations. In a bid to reduce these costs and comply with requirements, they are turning to chilled water systems. The cooling system transfers heat from production processes and industrial equipment. Two most notable components in these applications are chiller (cooling unit) and heat exchanger. The heat exchanger enables the plant equipment and production processes to lose heat to the cooling water. The chiller collects the heat gained from the processes/equipment. This heat can be lost through either a closed loop system or the atmosphere (via cooling towers). A reliable chilled water system is crucial for perpetual comfort in buildings. In most cases, designers only give the project attention only in the initial stages of operation. These systems ought to serve the users for decades despite the inevitable evolution and change of the facilities. 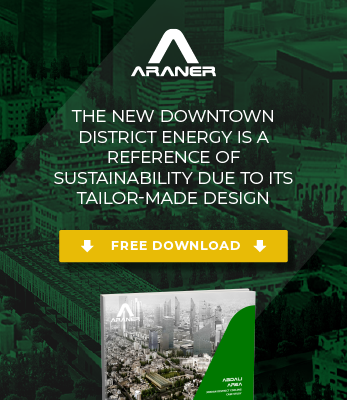 To determine the best design practice for long term service of the system, Araner analyses how various system components respond to present and future factors. For instance, the team seeks to know how coils are affected throughout the life of the system. For successful analysis, modern software is used and parameters modified. Our simulation processes are popular because they help experience conditions before they actually happen. Simulation is crucial because issues such as fouling and friction can affect the performance of a chilled water system. As air and water contact the coils, scale and particulates form on the surfaces. Fouling hinders heat transfer and reduces efficiency of the system. For a big project, seemingly small factors can translate into large losses. Moreover, the weather can be a hindrance, especially if your project is in the tropics. With many years’ experience in commercial refrigeration projects, Araner is able to apply the expertise and knowledge gathered to offer solutions that will ensure highly efficient systems. This can be achieved through a brand new installation or improvement of the existing one, whichever our analysis and your decision will lead us to. One of the areas of focus is the pumping system, where energy usage is minimized as much as possible. Two methods to achieve this are putting pressure settings at the lowest possible value and scheduling properly. Pumps also need things such as oiling, alignment and positive suction pressure. Large projects will most likely experience demand peaks, so a Thermal Energy Storage installation is necessary. Demand during the day can be covered by chilled water from the TES tank stored overnight when costs are power costs are normally low. TES can even be a more economical alternative to new chiller, in case you are looking to expand your chilled water refrigeration system. All these activities amount to maintenance of the system, which is the best way to counter Low Delta T Syndrome, a system problem that leads to inefficiency. From laying of kilometers of pipework, to swift chiller efficiency replacements, to the installation of reliable chiller plant, the team at Araner has all under their sleeves. We have completed big projects, so no matter the scope of your project you can be sure we will deliver. Most important, we will ensure it saves you money. For more details about our chilled water system services, contact us any time.